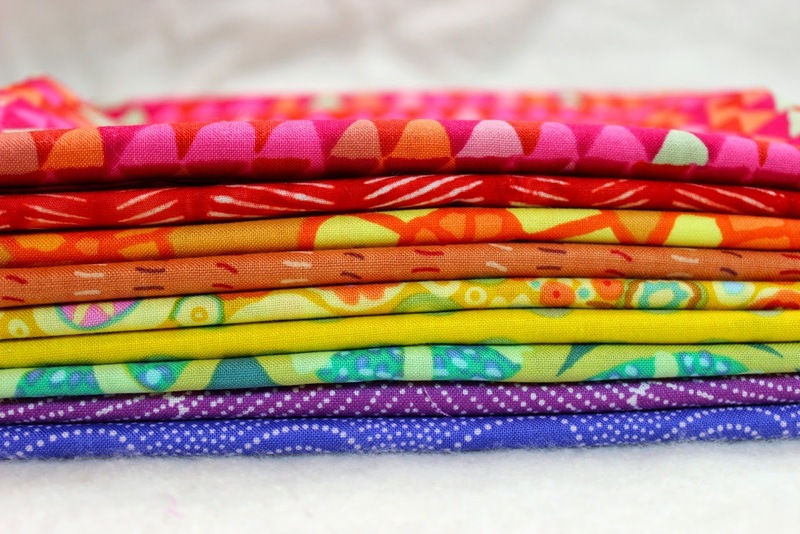 I was recently asked by Jackie Kunkel, owner of Canton Village Quilt Works, to put together a “Blogger’s Bundle” of fat quarters from her shop. Since I am really feeling the vibe of saturated color lately, this is the bundle I chose. It makes me want summer! 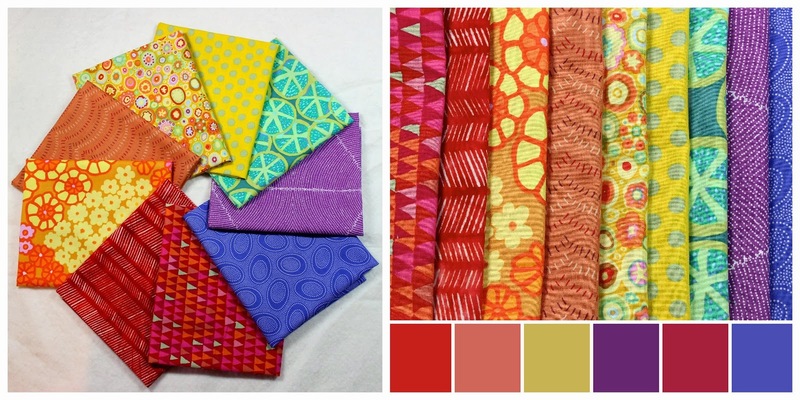 The bundle consists of fabric from Kaffe Fassett, Australian Aboriginal, and Batiks. This Over the Rainbow bundle is available for sale from Canton Village Quilt Works. Jackie has been quilting for over 20 years and is a gifted quilt designer and teacher. If you follow her blog, you will see her amazing, detailed quilts in deep, saturated colors. Canton Village Quilt Works also stocks an amazing selection of Kona Cottons. CVQW is often my go-to source when I stock-up on Kona’s. Jackie has a huge selection of not only dozens of different shades, but also Kona bundles and pre-cuts such as jelly-rolls, charm packs, and hexagons in multiple palettes. Another one of my favorite basics CVQW keeps in stock is Essex Cotton-Linen blend. I have ordered those frequently from Jackie for the past few years as well. Her service is excellent. Today, Jackie is generously giving away one of these Over the Rainbow fat-quarter-bundles (a $25.00 value) to one of you! If you would like to enter to win this bundle, sign up for the Canton Village Quilt Works Newsletter. This is full of information and frequent specials and sales (perfect for stocking up on basics like Kona solids!) For a second entry you can also follow the Canton Village Quilt Works blog. You can also keep track of Jackie and Canton Village Quilt Works on Facebook and through Jackie’s podcasts here, on itunes, or on YouTube. Thanks so much for the giveaway, Jackie! I already get Jackies newsletter. I live that runner! I already follow CV blog. I already get the CV newsletter. Thanks for a chance! I follow Jackie&#39;s blog via Bloglovin. I follow Jackie with Google Friend Connect. Thanks for the chance to win. I already get Jackie&#39;s newsletter. Thanks for the chance to win this beautiful fabric. I signed up for the newsletter long ago. I already get the newsletter and follow the blog on bloglovin. Thanks for this great giveaway. The colors are just what we need after this long winter. I signed up for their newsletter. Thank you. I follow their blog on Bloglovin. and get the newsletter too! Thanks for hosting this fab giveaway. Thanks for the chance to win, I love Kaffe Fassett fabrics and shot cottons. I am now following the blog. Thanks again for sharing! I just signed up for CV newsletter! I get the CVQ newsletter. Jackie&#39;s work is amazing! I follow CVQ via GFC. I am now following CVQ blog via email. Thanks! I&#39;ve signed up for the newsletter. Thanks! I follow them on Bloglovin! I am already signed up for the newsletter! Thanks for a fun giveaway – love the colors! I follow the CVQW blog via GFC! Thanks! I signed my for the newsletter. Thanks for the chance to win! Lovely bundle! I am already signed up for the newsletter. Found a new shop and blog to follow! Yay!! I already receive the newsletter. Jackie says, &quot;Hi&quot;! Thanks for the chance to win! just take a look at the gorgeous colors in this fabric. just stunning. i myself would not put yellow and red together. yet look how that yellow just pops out at you. thank you for a chance to win such beautiful fabric. I&#39;ve subscribed to Jackie&#39;s newsletter. I&#39;ll now following Jackie&#39;s blog on Feedly. Signed up for the newsletter! Woot! Love Kaffe! I subscribe to the newsletter. Thanks for the chance. I follow canton village quilt works blog through blog lovin. Love these colors so much – my table is calling for a vibrant runner for the summer! I already follow Canton Village Quilt Works, so I guess I am in! Jackie said to visit Amy and tell her I said hello! <br />I get her emails. I&#39;ve been following Jackie&#39;s blog for years. The bundle looks wonderful. I also get Jackie&#39;s newsletter. Beautiful colors! Signed up for the newsletter. Have followed the blog for over a year. Love it! I have been a follower of Jackie&#39;s for a long time. I also get her newsletter. And also her blog posts! Hi, Amy! You and Jackie together – that&#39;s a fun team-up! 🙂 I get her newsletters. And I follow her on my blogroll and in Facebook. 🙂 You guys are both bright spots in my Quiltosphere! I am following the blog! I get the CV newsletter! Now following her! Can&#39;t wait! signed up for both….love those colors! I have been following Jackie&#39;s blog for some time. I receive the newsletter. Love these! Signed up for the Canton Village Quilt Works Newsletter. I already received the newsletter. Following Canton Village Quilt Works blog. I already follow Jackie&#39;s blog! I&#39;ve been receiving Jackie&#39;s newsletter for a couple years now. Love her shop! I&#39;ve been following Jackie&#39;s blog for a couple years now. Hi! I am following your newsletter. Love it! I signed up for the newsletter e-mail. Hi again! I have been following your blog for a couple of years. So full of info. Love Jackie.Thanks for this chance. I follow too. And Jackie says &quot;hi&quot;! I follow her on bloglovin. I already get the Canton Village Quilt Works Newsletter. I signed up for the Canton Village Quilt Works blog via Google +. I already get the CVQW newsletter! I follow the CV blog! I&#39;m all signed up for CVQW newsletter….thanks! I haven&#39;t been to her store before, and seeing her beautiful work makes to happy to have signed up for her newsletter! What inspiration! I subscribed to her newsletter! I am already receiving her newsletter!! Thanks for the chance… this sure is one yummy bundle! Love all those colours! I am already following theCV blog via Bloglovin&#39; – thanks for the chance! I&#39;m already receiving the CVQW newsletter – thanks for the wonderful giveaway. I&#39;m a follower of Jackie&#39;s blog too. Thanks again. Get the Canton Village Quilt Works Newsletter. I signed up for the newsletter. What gorgeous fabrics! I&#39;m all signed up for their newsletter. Thanks for sharing! I now follow their blog. I already receive Jackie&#39;s newsletter. You have picked a fabulous bundle, great eye! I&#39;m signed up for their newsletter. These are such bright and cheery fabrics! Already a follower! Love the color pallet of this giveaway. I follow the blog by email. Thanks! You picked a fabulous bundle! I love the colors! I receive Jackie&#39;s email newsletter! I already get the Canton Village Quilt Works Newsletter. Thanks. I follow the blog with GFC. Thanks. Love the Spring like bundle of fun.! I get their newsletter! I also follow their blog! thank you again! I also follow Jackie&#39;s blog. Thanks for hosting this giveaway! I started following their blog! I&#39;m already getting Jackie&#39;s newsletter via email. I also already subscribe to Jackie&#39;s blog via email. Love the fabric and I follow on Feedly. What a fun bundle. I get the CVQW newsletter~ such a fun one. Thanks for the chance! I signed up for the newsletter. Thanks for this opportunity. I also follow the Canton Village Quilt Works blog. Signed up for the newletter. I already receive the Canton Village Quilt Works Newsletter. I follow Canton Village Quilt Works on bloglovin. Love your site and hers too! Signed up for the newslwtter! I love the bundle that you selected Amy! I get the Canton Village newsletter. I follow the Canton Village blog on Bloglovin. Thanks for the chance to win! With this cold, snowy winter bring those bright colors my way. Yes I do follow the Canton Village Newsletter, love it! I already get the CVQW newsletter. I signed up to get the Canton Village newsletter. That counts for 1 entry I hope. I absolutely Love this bundle! It&#39;s gorgeous. I follow Canton village blog. I also get the Canton Village Newsletter. I follow the CVQW blog in my bloglovin reader. I signed up to follow along with the Canton Quilt Village blog on &quot;Blogloving&quot;. This counts for a second entry I hope also. I already follow Jackie&#39;s newsletter ///Love it! Love that fabric too! I already get the CVQW newsletter and her blog! Stunning bundle.Thanks for the chance! I get Jackie&#39;s newsletter. She is one talented lady. I follow on bloglovin, thanks for the chance! I receive CVQW their newsletter. I also follow both of the blogs. I am a subscriber of Jackies newsletter. I follow Jackies blog via Bloglovin. I already receive the newsletter, and I follow your blog. Love you both. Thanks for the chance to win. Matsche.christine@yahoo.com. i follow her via bloglines to get her posts. I&#39;ve already received their newsletter! I follow Canton Village blog through bloglovin&#39;! I didn&#39;t know they had a blog! Signed up for Jackie&#39;s newsletter. Used to read it earlier but lost track of it. Love your bundle..spring has been late this year so all that color sure cheers me up!!! I follow the blog! If I don&#39;t win I think I may have to pick up one of these bundles. I love the rainbow colors. I joined to get the newsletter!! Happy follower of Jackie&#39;s blog! I&#39;m a new subscriber to Jackie&#39;s newsletter. Pretty fabrics! I get the CVQW newsletter. I get the newsletter, and love it! I follow the blog! Thank you for the chance to win! I follow Jackie&#39;s blog. One talented lady. I follow the blog too…love it! I follow thru Bloglovin &amp; Email both too.. I signed up for the newsletter. Thanks for putting my name in the hat for the drawing! I follow on blog lovin. Thanks again for another chance! I now follow her blog via email like yours! Hi I signed up for her blog too fun info. I already follow the CVQW blog..thanks for the sweet giveaway! Just signed up to the newsletter. Great giveaway! I am now following Jackie&#39;s lovely blog. I`ve signed up for Jackie`s newsletter. I follow Canton Village Quilt Works on Bloglovin`. I follow Jackie on Bloglovin…Don&#39;t want to miss one thing she does ! Ok, I just spent the last 45 minutes on the newsletter- I am following through email! I also am following the blog through email. Wow. Nice website. I love kaffe fabrics. Thanks for the links. I subscribe to Canton Village newsletter. Yes, love Jackie&#39;s newsletter…Love to win the fabric giveaway! I follow the CV blog. I&#39;m signed up for newsletter. I just started following the blog. Thank you for the giveaway!!!!!!!!!!!!!!!!! I love them all!!!!!!!!!!!!!!!!!!! I already follow Jackie&#39;s blog. I actually would have worn a dress made from that one quilt she had draped over a dress form! I&#39;ve been receiving the Canton Village newsletter for some time now. Thanks for the awesome giveaway! I&#39;ve been getting CVQWs newsletter for quite a while now and it was so great to meet her in person at the quilt show at the New England Air Museum last year. I&#39;ve also been following her blog for a long time now. Thanks for the chance to win. I already get the newsletter. Hope I win. I am now following her. Subscription confirmed! Thanks for the introduction. I&#39;m signed up for the newsletter! Beautiful fabric! Thanks for the giveaway! I am now following her blog. I love learning about new blogs to follow! I follow Jackie&#39;s blog and now I&#39;ll follow yours! Thanks for the opportunity! I follow the blog….love all that orange!! I follow the newsletter……great bundle! I already receive CVQW;s newsletter. Thanks for a nice giveaway Jackie. I also get the newsletter, and have for some time! Thanks for the chance! Thanks for the chance at the giveaway. I follow the blog. i subscribed to her newsletter. thanks for the chance! I signed up for the newsletter. Love your bundle! I subscribed to Jackie&#39;s newsletter. I am now following Jackie&#39;s blog. Thanks for the chance! And I signed up to follow her blog! Thanks.. I love discovering new (to me anyway) designers. I get the newsletter. These are incredibly beautiful colors! Love it. I also read her blog. Great giveaway! I&#39;m following the blog too! Thanks for the tip! I already get the newsletter. Happynwhen it shows up in my mailbox. I follow Jackie&#39;s blog too. I am following the blog. Wow! What a great sense of colour Jackie has! Talent!!! I signed up for the newsletter too! Can&#39;t wait! I follow CV via email – my fav way to follow! (laura84watt) Thanks for the lovely giveaway. I&#39;m following CVQW with bloglovin&#39;. I just signed up for the newsletter! Can&#39;t wait to see what it has to offer! I just followed Jackie blog! Thanks for hosting the giveaway! I follow Canton Village on Bloglovin! I already get Jackie&#39;s newsletter. I already follow Jackie&#39;s blog and her FB page!! I sound like a stalker now LOL. Recently signed up for Jackie&#39;s Blog ! Awesome, Thanks. I love learning about her online store. The fabrics are very pretty. I signed up for CVW&#39;s newsletter. I already following CVW via Bloglovin. I follow the blog by email. Thanks for offering the giveaway. I subscribed to the newsletter and am looking forward to seeing more of her gorgeous work! Thanks for hosting this giveaway. I just signed up to receive her blog posts via email. Love Canton Village Quilt Works and am a follower already. The bundle is gorgeous. Thanks for hosting the givaway! Canton Village Quilt Works was new to me until I read your blogpost this morning, but it looks like a great shop! I am now receiving her newsletter! I am also now following her blog. Thanks for the chance to win your beautiful bundle! I&#39;m a follower of Jackie&#39;s blog. And, she says hello! thanks! I get Jackie&#39;s Newsletter and enjoy it very much!!! I signed up for the newsletter. Those fabrics are beautiful. Thanks for the giveaway. I&#39;m learning to love brights! It&#39;s taken me a while but these colors are awesome! Wonderful choices, Amy! I get Jackie&#39;s newsletter. I am a follower of Jackie&#39;s blog. I have signed up for the CVQuiltworks newsletter. I follow Jackie via Bloglovin. Love those bright fabrics. I am a Jackie fan! Already follow Jackie Love her quilts. I follow her blog via email. Thanks! I receive Jackie&#39;s newsletter–I love her enthusiasm! I follow Jackie&#39;s blog. Thanks for the chance to enter. I love receiving CVQW newsletter! Absolutely beautiful, deep colors that really pop. Thanks for sponsoring the bundle giveaway. I love the saturated colors. They are so bright and fun. I want to design a quilt around the flags at the Sochi Olympic games and they are perfect! Great, exciting colors! I follow her blog now. I signed up for the newsletter. What a beautiful selection of fabrics you chose!! Beautiful fabrics! I&#39;ve signed up for the newsletter. Following you both on G+ and i get your daily feed thanks for the giveaway! Thanks for the chance to enter. I am enjoying reading Jackie&#39;s blog. I follow Jackie&#39;s blog via email. Thanks for featuring her shop. I am signed-up for her newsletter. Very pleased to find a resource for saturated fabrics! Just signed up and appreciate the change<br />to win. Very pleased to find this great fabric resource. Thanks for opportunity to enter giveaway. Signed up for both newsletter and blog. Great fabric resource!<br />Thanks. Following both blogs through bloglovin – thanks for the opportunity! I follow the blog through pinterest and instagram. I have followed her blog for years – she is the bestest ! I have Jackie&#39;s blog on my blogroll, so I read it all the time. Great giveaway! Thanks to you both! Nice wake-up surprise! Beautiful bundle!! Thanks for this offer! I already get Jackies newsletter. Love these fabrics! Thank you for the chance to win. I get Canton Village Quilt Works. I enjoy all your posts on FB, Jackie! I enjoy your posts on FB, Jackie. I signed up for the newsletter.. I love the bright colors &amp; funky patterns on the fabric…Jackie said I had to enter through your blog. Love all the fabric, especially solids! Thanks for the chance! I follow the CVQW blog via email and facebook!! 🙂 Thanks for the chance to win!! I am signing up for Jackie&#39;s newsletter. I love the rich colors as well. It makes me sad to think there&#39;s a quilter out there who&#39;s NOT already getting the Canton Village Newsletter. It makes me sad to think there&#39;s a quilter out there who doesn&#39;t already get the Canton Village Newsletter. I subscribe to Jackie&#39;s newsletter. She says hi, BTW. I follow the CVQW blog. Love that fat quarter bundle! Getting the newsletter! Love the colors! I already receive Canton VIllage&#39;s newsletter – always packed with lots of good information! Jackie Kunkel says Hi and so do I! I already get her newsletter too! I follow Jackie Kunkel&#39;s Blog too! What a great giveaway, I would love to create something with it!! I am now inspired to make a quilt with solids…thanks! thank you for this beautiful bundle! Signed up for the newsletter – LOVE the beautiful colors!!! Signed up for the blog too – crossing my fingers! I already follow Jackie&#39;s blog – love the eye candy for sure! I get the newsletter. Thanks for the giveaway. I just signed up for the newsletter! Excited to have come across this page! Subscribed to the newsletter. Thank you! Subscribed! Thank you for the giveaway, Amy. I always enjoy your blog. Signed up for the newsletter – that quit is to die for! And now I&#39;m following the blog! What a beautiful, colorful bundle! I signed up for her newsletter and blog. I follow the CVQ blog. I can&#39;t believe I lucked out and you still have this giveaway open. I just subscribed to your site by email. I also subscribed to Jackie&#39;s Newsletter. New website for me and now I get a newsletter on top of it…yeah! Seems I&#39;m doomed to blog a second time, sorry. Glad for all the information and beautiful colors on this blog! Lovely bright colors! I am signed up for the newsletter. I follow CV on bloglovin&#39;. I already receive Jackie&#39;s newsletters! 🙂 Thanks for a chance to win this fabulous bundle of fabric!